Does your family love plush all-inclusive Caribbean resorts where you can play all day long, enjoy good meals, and relax on a beach vacation? Consider Beaches Turks & Caicos Resort Villages & Spa, a top all-inclusive kid-friendly resort that wins accolades and awards from travel magazines and TripAdvisor alike. This is the largest resort in the Turks and Caicos islands by a long shot. The 93-acre resort features 750 rooms spread across four villages, each themed to reflect a distinct architecture and ambiance, from Italy and France to the Caribbean and Key West. The resort is part of the Beaches chain of family-friendly all-inclusive resorts found in the Caribbean. 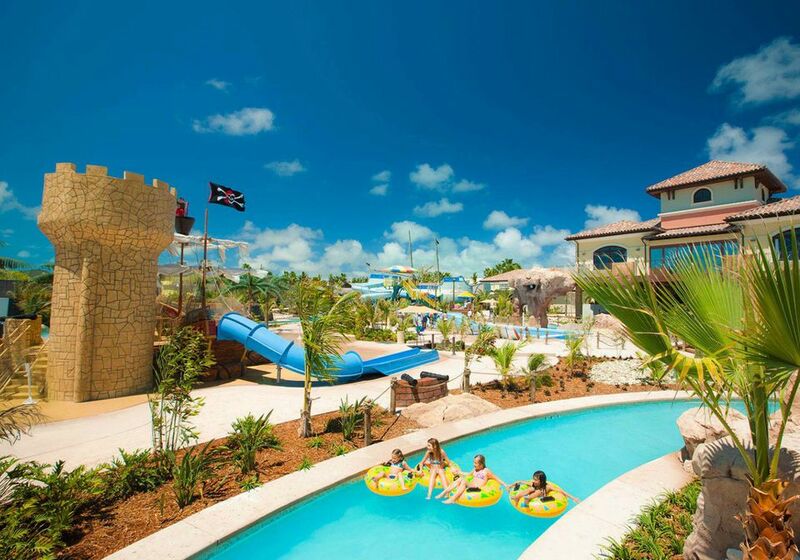 The resort boasts a dreamy setting on Grace Bay, offering water sports of every kind, plus the gigantic Pirates Island Water Park with its lazy river, wave pool, multiple water slides and kiddie splash area. Thanks to a partnership with Sesame Street, you'll see Big Bird and other favorite characters posing for photo ops and meet-and-greets near the pool and in the lobby, and the resort also offers character breakfasts for the preschool crowd. Do your kids like to meet friends and hang out with their peers? There's a kids camp for children ages 6 to 12, and an Xbox Play Lounge and a teen lounge called Club Liquid. In addition, there's a full-service nursery overseen by accredited nannies. Turks and Caicos is a top diving destination and scuba is all-included here, except for an instructional course offered for first timers that does incur a charge. If you've always wanted to try diving, this is a great opportunity for adults and kids ages 12 and up. Beaches Turks & Caicos is located in the Turks and Caicos islands, an archipelago of more than 40 islands—eight of which are inhabited—set against breathtakingly beautiful azure waters halfway between Florida and Puerto Rico. More specifically, the resort is set on the north shore of Providenciales, along Grace Bay, one of the most beautiful beaches in the Caribbean, known for its crystalline sand and shady casuarina trees. Beaches Turks & Caicos is a large resort with a variety of accommodations options, including standard hotel rooms, family suites, and villas. Some suites come with a special VIP concierge service and butler Service is also available at this resort. While most accommodations are hotel-style throughout the resort, the newest village, Key West, offers luxurious multi-bedroom condo-style lodgings. Dining is a high point at this resort and it's a far cry from the ho-hum buffets that once gave all-inclusive resorts a bad name. Families can choose from among 22 dining options, including 19 international a-la-carte restaurants offering cuisines ranging from French and Italian to Japanese and Southwestern U.S. Other options include everything from sushi and seafood to pizza. At this resort, the term "all-inclusive" includes all meals and drinks, unlimited use of most land and water sports and gratuities. Spa treatments, excursions, and certain activities (the scuba training course, for example) cost extra. dreamy setting on Grace Bay, with its 12 miles of gorgeous white-sand beach and tranquil waters. next door is a marine park with excellent snorkeling and scuba diving. There is also a coral reef right off-shore. Pirates Island Water Park features water slides, lazy river, surf simulator, zero-entry kiddie pool with spray jets and water cannons and a huge pirate ship.